Ricotta cheese gives this easy pasta dish a light and creamy texture, while the pinenuts add a contrasting crunch. 1. 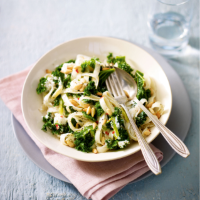 Cook the tagliatelle in a large pan of boiling salted water for 6 minutes, then add the kale and cook for a further 3 minutes. 3. Drain the tagliatelle and kale and return to the pan. Stir in the garlic mixture and most of the basil. Gently fold through the ricotta. 4. Divide between 4 shallow bowls then scatter over the pinenuts, remaining basil and a good grinding of coarse black pepper. Take care when cooking the garlic that it doesn’t brown as this can give a bitter flavour. This dish is also delicious eaten cold and makes a lovely packed lunch.